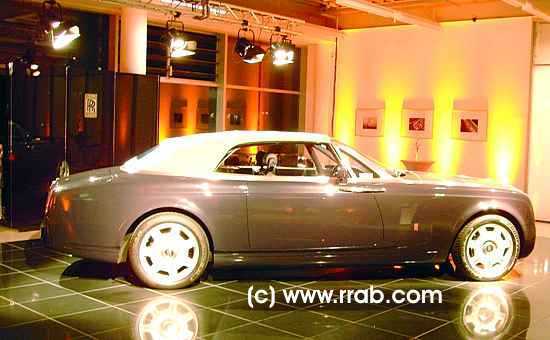 2004 marked the 100th Anniversary of Rolls-Royce. The marque could be traced back to the year 1904, when the first meeting of Frederic Henry Royce and Charles Stewart Rolls resulted in their decision to produce Rolls-Royce motor cars. 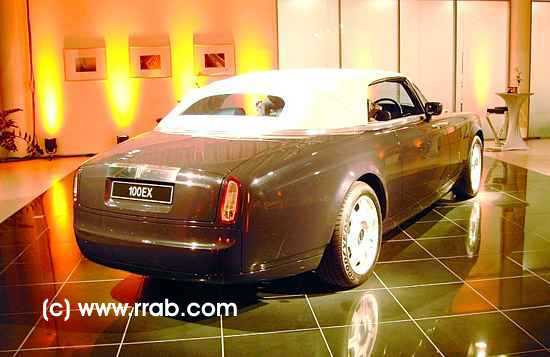 To launch the Rolls-Royce 100 EX Centenary experimental car was one of the highlights by Rolls-Royce Motor Cars to celebrate the event. The two-door four-seater drop-head coupe of really ostentatious dimensions made its debut at the Geneva Salon in March 2004. 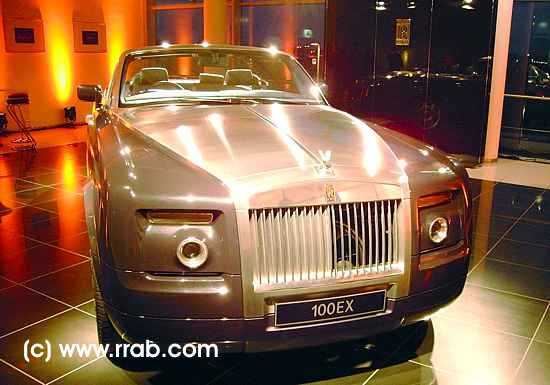 Thus was given a glimpse of future developments at Rolls-Royce Motor Cars, a wholly owned subsidiary of BMW Group. From 2003 onward their Rolls-Royce Phantom, a four-door model had been supplied from a new factory located in Goodwood in the South of England. The design of the drop-head coupé though obviously influenced by that of the Phantom didn’t come from the United Kingdom. It had been created at BMW Group’s studio Designworks in Southern California in the USA and the experimental car had then been built by a department of BMW, Munich, that was specialised on such tasks. All this unmistakeably indications of Rolls-Royce Motor Cars being under the wings of a ‘Global Player’. Based on a lightweight aluminium space-frame one remarkable feature of the body were rear-hinged doors. The early 50ies had been the last period when such had been found on but very few two-door cars. A highly sophisticated door-locking mechanism was a must even on an experimental car. After all these doors where burdened with the epitaph ‘Suicide Doors’, a reflection of the fact that doors inadvertently opened during driving could rarely be shut again; usually flung most dangerously fully open from wind-pressure. Not only the space-frame was made from light alloy, that also was the material for the bonnet. The windscreen surround plus A-post were machined from solid aluminium, too. The theme was reaching further with a polished aluminium waist rail surrounding the passenger compartment. 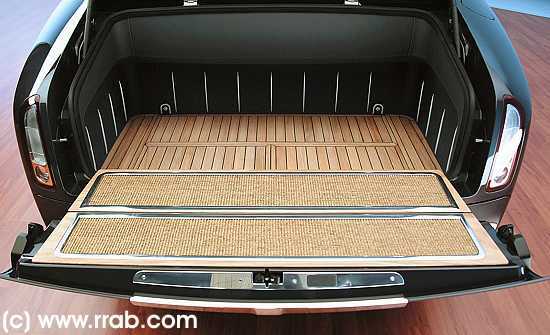 Bleached teak decking was an eye-catcher on the tonneau cover for the folded hood; formed teak footwells accentuated the flooring. However the interior wood veneer, e.g. on the dashboard, is figured mahogany. The designers admitted they had been keen to run “a strong nautical theme” throughout. Responsible exterior designer was Serbian-born Marek Djordjevic, who on this model – as a variation from the Phantom he had designed – was keen on a silhouette with a rise in the waistline over the rear wheels. And he positioned the classic radiator in a surprisingly rakish style. The traditional emblem of entwined RR on the radiator was red (instead of the standard black). The Spirit of Ecstasy mascot was made in hallmarked silver. A design-peculiarity that deserves to be mentioned was the two-piece bootlid. The lower part of that could be folded down to a horizontal position; though perhaps it shouldn’t be employed like similar features on pre-war cars, i.e. to carry additional luggage. In Rolls-Royce Motors Cars’ parlance the 100 EX Centenary was an experimental car and they clearly separated this new model from a ‘concept car’ of mere prototype standard. No doubt was left this was a one-off with yet no decision as regards series-production. That the experimental car’s role was to test and evaluate new systems, components and features did permit the conclusion though of certain design-elements and/or mechanical components to make their way into series-production. This caused the new engine to become a focus of interest. A light alloy V16-engine of 9 litres capacity; naturally aspirated, neither turbo- nor supercharging. At present there is not a single car manufacturer in the world offering an engine with sixteen cylinders and four valves per cylinder.